Today and today only, there is a special - buy two espressos and get any third drink free. There are no other specials. Ralph and Janet are each ordering three beverages from this menu. Who, if either, will pay more? Statement 1: Two of Ralph's drinks are espressos. Statement 2: Two of Janet's drinks are cappucinos. Each statement alone gives information about only one order, so at the very least, both statements will be necessary. From Statement 1, it is known that Ralph will pay for his drinks, since he will only pay for the two espressos. From Statement 2, it cannot be determined exactly what Janet will pay. However, she will pay for all three drinks, two of which are cappucinos; the least she will spend is the price of two cappucinos and an Americano, which is . From both statements together, it is definite that Janet will pay more. Patty and Mickey each order three beverages from the menu. Who, if either, will pay more (disregard tax)? Statement 1: All three of Patty's drinks are Turkish coffees. Statement 2: One of Mickey's drinks is an Americano. From Statement 1 alone, you know that Patty spent . It is possible, however, that Mickey spent more (for three espressos, for example), just as much (on three Turkish coffees), or less (for three cappucinos, for example). Statement 2 alone gives you even more scant information, since it only tells you one beverage Mickey bought. Suppose you know both statements. Then you know Patty spent . You do not know how much Mickey spent, but the most he could have spent was (for an Americano and two esperessos). Therefore, the two statements together are necessary and sufficient to answer the question. Below are the results of the initial election for senior class president. No candidate won a majority, so Crane and Trask faced each other in a runoff. Every student in the senior class voted in both the initial election and the runoff. Every student who voted for Crane in the initial election voted for Crane in the runoff, and every student who voted for Trask in the initial election voted for Trask in the runoff. Who got the most votes in the runoff, Crane or Trask? Statement 1: All of the students who voted for Jones in the initial election voted for Crane. Statement 2: Two-thirds of the students who voted for Wells in the initial election voted for Trask. students voted, so 236 votes were necessary to win a simple majority. From Statement 1 alone it can be determined that Crane won at least votes (his own initial votes plus all of the votes that previously went to Jones), and Trask won at least 98 (his own initial votes). From Statement 2 alone, it can be determined that Crane won at least (his own initial votes plus one-third of the votes that previously went to Wells), and Trask won at least votes (his own initial votes plus two-thirds of the votes that previously went to Wells). votes. Therefore Crane is the winner, and both statements are needed to prove this. The table below gives the population of the city of Renfrow for each of six census years. Did Renfrow have a larger population in 1945 or 1955? Statement 1: The population rose every year from 1940 to 1950. Statement 2: The population rose every year from 1950 to 1960. Statement 1 alone tells us that the population of Renfrow in 1945 was between 13,251 and 15,049, but says nothing about the population in 1955. Similarly, Statement 2 alone tells us that the population in 1955 was between 15,049 and 19,415, but says nothing about the population in 1945. The two statements together, however, tell us that the population rose every year from 1940 to 1960, so the population in 1955 had to have been greater than the population in 1945. Did Renfrow have a greater population in 1965 or 1975? Statement 1: The population of Renfrow decreased every year from 1960 to 1970. Statement 2: The population of Renfrow increased every year from 1970 to 1980. From the two statements together, it can only be surmised that the population in both 1965 and 1975 exceeded the 1970 population. No conclusions can be drawn about the size of the 1965 population relative to the size of the 1975 population. The above is the menu at Monorail Sandwich Shop. Julie and Janice are each ordering four sandwiches from the above menu. Julie works at Monorail and is entitled to a 25% employee discount; Janice does not work at Monorail. Who will pay more for her sandwiches, ignoring tax? Statement 1: Janice is ordering four veggie sandwiches. Statement 2: Julie is ordering four beef sandwiches. DO NOT calculate how much Janice and Julie will pay! It's extra work that will slow you down on test day. We don't actually need to determine which of the two women will pay more - we only need to decide if it is possible to figure out who will pay more. Obviously neither statement alone tells us enough. Together, however, the two statements tell us exactly what Janice and Julie ordered. Therefore, using both statements, we have enough information to answer the question. Four candidates - two boys named Patrick and Quincy, and two girls named Rhonda and Sally - ran for student body president. By the rules, the candidate who wins more than half the ballots cast wins the election outright; if no candidate wins more than half, there must be a runoff between the two top vote-getters. You may assume that no other names were written in. As can be seen in the figure above, which reflects the share of the vote each candidate won, there will be a runoff. Which two candidates will face each other? Statement 1: Candidates A and B are both girls. Statement 2: Candidate B and C are Rhonda and Patrick, respectively. 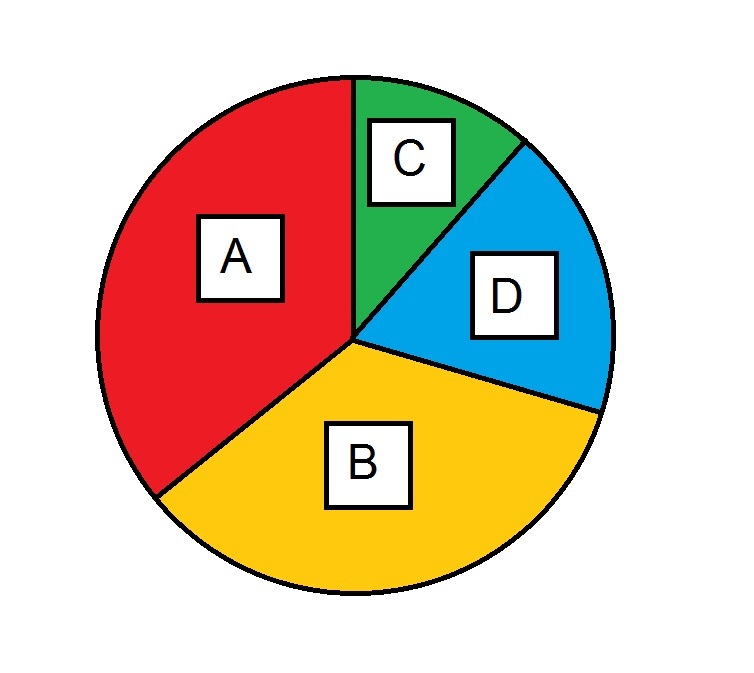 Candidates A and B are the top two vote-getters, so we must establish which two candidates are A and B. Statement 1 does just that by identifying them as Rhonda and Sally. It does not identify which one is which, but it is not necessary to know that. Statement 2 identifies Rhonda as Candidate B, but only Patrick can be eliminated as Candidate A. Four candidates - two boys named Mickey and Oswald, and two girls named Nora and Phyllis - ran for student body president. By the rules, the candidate who wins more than half the ballots cast wins the election outright; if no candidate wins more than half, there must be a runoff between the two top vote-getters. You may assume that no other names were written in. Statement 1: Nora is candidate B and Oswald is Candidate C.
Statement 2: Candidates A and C are boys. Statement 1 alone establishes that Nora is Candidate B, making her one of the top two vote-getters. Oswald is not one of the top two, since he is Candidate C, but neither Mickey nor Phyllis can be eliminated as Candidate A. Statement 2 alone established that one boy is Candidate A, one of the top two vote-getters. Since the other boy is Candidate C, then the other one of the top two, Candidate B, is a girl. However, it does not establish the identity of any of them. Now, assume both statements to be true. By Statement 2, the top two are a boy and a girl. Statement 1 establishes that the girl is Nora. Since Statement 1 also establishes that Oswald is not the boy, the boy is Mickey, and it follows that Mickey and Nora will face each other in the runoff. Four candidates - Anya, Barry, Carla, and David - ran for student body president. By the rules, the candidate who wins more than half the ballots cast wins the election outright; if no candidate wins more than half, there must be a runoff between the two top vote-getters. You may assume that no other names were written in. Statement 1: Neither Barry nor Carla is Candidate D.
Statement 2: Anya is candidate C.
Neither statement alone is sufficient to answer the question. Assume Statement 1 alone. Barry and Carla could be Candidates A and B, respectively, in which case they would be the runoff candidates; also they could be Candidates B and C, respectively, in which case, Barry and one of the other two would be the runoff candidates. Statement 2 alone only knocks Anya out of the runoff election; it leaves the other three as possible candidates. Assume both statements to be true. Anya is Candidate C. Candidate D, being neither Barry nor Carla, is David. Therefore, Candidates A and B are Barry and Carla; it is unclear which is which, but it is irrelevant; either way, they are the top two vote-getters, and they will participate in the runoff.